I've had this axe for a while now so it is about time that I did some kind of review. At 800g this is classed as a mid weight axe, falling in-between the Gransfors Swedish Carving axe (1Kg) and the Gransfors Wildlife hatchet (600g). The weight was the main factor for me in making this purchase, but I have to say that 200g less doesn't make that much difference, so if you're looking for a lighter axe then you may want to pick something else. The handle is 1/2" shorter than the SCA at 13 1/2", it is made from elm and has the lovely textured finish that you get with most of Svante Djarv's tools. I think that the handle would benefit from being a little bit thinner as it's 38mm at the point where I hold it the most. This makes it thicker than any of my other axe handles (SCA is 35.5). I've not found the thickness to be a problem yet, but Sean Hellman wrote a great blog post a few months back about the thickness of axe handles and how they can cause strain injuries. Check out his post here. The great thing about this axe is the head (obviously). It has a very long edge at 5 1/2" with a continuous curve that combine to make for a very efficient slicing action. It has a spacious beard that make it very comfortable for choking up close. If you compare it to the beard on the SCA, you can see that not only is there more space for your fingers, but it also allows you to get further behind the blade. This gives you more control and also allows you to grip the axe in several different ways so that you can use the axe almost like a knife. I learned to use these grips after seeing Jon Mac using a Nic Westermann axe on his blog. You can see his post here. They make it easier to get more wood off with the axe before you move on to using a knife. Another feature that makes it more comfortable to use the axe like this is the way that the edges have been rounded off. This is both practical and a nice aesthetic touch. There is also a groove on the poll of the axe that you can rest your thumb in when using the axe for precision cuts with your finger extended along the cheek of the axe. The head is secured to the handle with a single wooden wedge making it easier to replace the handle if necessary. My Viking axe has a symmetrical bevel, but it is available with an asymmetric bevel with either a left or right hand bias. I've seen it described as having a 30 degree bevel with a flat grind, this is certainly not the case with mine. I measured the bevel at 23 degrees and it is clear from the visible grind marks that it is actually hollow ground with a partial flat area at the edge and back of the bevel. This makes it easier to sharpen to a full flat bevel if you want to, but I don't think that it's necessary as it comes very sharp and works well. I guess that it will become flat in time through sharpening. 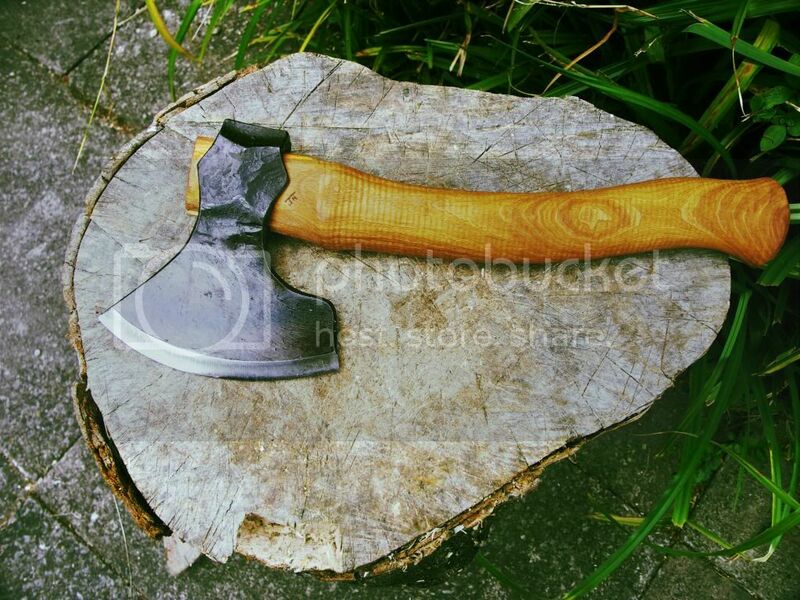 In conclusion this is a very versatile carving axe made with the highest level of craftsmanship. I would highly recommend it. It is available in the UK from Woodland Craft Supplies or Woodsmithexperience.co.uk. I am not aware of a US supplier, but Country Workshops supply other Svante Djarv tools so if you contacted them you might be able to make a special order.